Dr. Sugata Mitra speaking at The Jefferson Theater. Photo courtesy of David Jones. 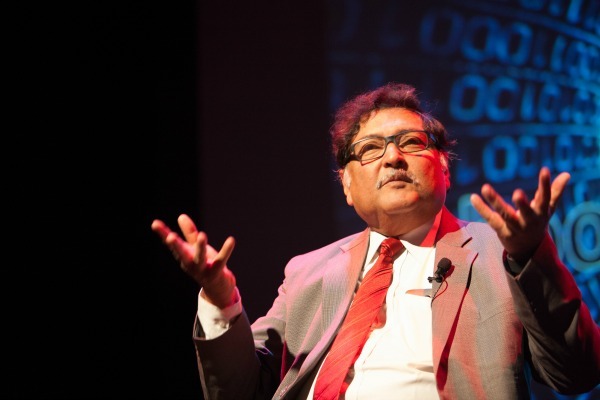 Charlottesville, Va., Oct. 18, 2015 - Dr. Sugata Mitra, 2013 TED Prize winner and noted education researcher, spoke to more than 1,000 combined community members at two public talks in Charlottesville this week. Hosted by St. Anne’s-Belfield School, Mitra discussed self-organizing systems in future schools at The Jefferson Theater on October 15 and St. Anne’s-Belfield School on October 16. Mitra, whose Hole in the Wall experiment of placing a computer with Internet access in a wall in a slum in India inspired Vikas Swarup's Q&A -- the novel adapted into the Oscar-winning film Slumdog Millionaire -- spoke on the characteristics of self organized learning environments (SOLEs) to the assembled students, teachers, educational leaders, and community members. “Groups of children using the Internet can learn anything, by themselves,” Mitra said, before noting that the requirements of a SOLE are relatively few: broadband Internet access, collaboration among the children, and encouragement from mentors. Professor of Educational Technology at Newcastle University, UK and previously a visiting professor at the Massachusetts Institute of Technology, Mitra is currently working on the School in the Cloud, a platform that allows students to use SOLEs and the Internet, rather than traditional schools and curricula, to answer "big questions" and occasionally connect with a global team of volunteer mediators. This project, for which he was awarded the 2013 TED Prize, is the culmination of over a decade of research and observations from all over the world, including India, Indonesia, Brazil, Uruguay, and England. Mitra’s findings, that students can successfully teach themselves anything using the Internet, is often challenged by those who feel he advocates replacing teachers with computers. To the contrary, he has consistently found that the support of an adult mediator is crucial to SOLEs. In this context the mentors encourage students to find their own answers rather than give them answers. Prior to Mitra’s discussions, St. Anne’s-Belfield School students took the stage to deliver short, TED Talk-style speeches on a variety of topics. Kayli Wren ’16 discussed her ideal service-oriented school on Thursday night, while on Friday eighth grade student Abril Tingey spoke on student-selected curricula and Jerry Yao ’18 delivered his thoughts on access to nature in formal education. “I greatly appreciate new and ‘out of the box’ ideas about learning, and wanted to share one idea of my own about education,” Wren said. The School’s Learning Village students in grades kindergarten through five enjoyed their own opportunity to learn from Mitra when he dropped in for a visit on Friday morning. In addition to touring their classrooms, Mitra spoke with them about asking BIG questions and finding their own answers. On Friday afternoon, Mitra toured the Upper School campus as well. Mitra’s talks were the first in St. Anne’s-Belfield School’s Inspiration Speaks series, a program bringing innovators and visionaries from around the world to encourage discourse of a variety of topics related to teaching, learning, education, and growth. For more information on the series, visit www.stab.org/inspirationspeaks.